A friend of mine likes to use the term “Cook’s Treat”. I think he picked it up from Nigella Lawson’s cooking show, and likes to call out the phrase whenever he snaps up a particularly tasty leftover trimming or yummy browned crust. The cook’s the one doing all the work, shouldn’t they get a break now and then? Now my interpretation of “Cook’s Treat” is more like taking a swig of wine when I pass it to my wife for the shrimp scampi pan, so my version is a little different….. but why not try using it all over the place? I’ve been tiling in the basement this summer, so how about a “tiler’s treat”? “Cook’s Treat” was called a few times on trips to the DIY store. Clearance sales, new pots, and irresistible plants all helped make lugging 75lb boxes of tile tolerable. On yet another trip for mortar and grout I stopped in at a local store which specializes in liquidating odds and ends from other retailers. Last year this store got in a load of pottery which included some chocolatey colored Italian terra cotta. I carefully (and frugally) bought only two pots at that time. On this visit I had my fingers crossed for an end of year sale, and almost let out an un-manly squeal when I saw 40% off. Four more nice sized pots for just under $7 each and some $2.50 bags of potting soil came home. The money I saved went towards an emergency nursery stop, and I picked up a dusty pink cape fuchsia (phygelius), purple aeonium, and a variegated hebe. They were not on sale, but still a bargain compared to all the time and money spent on the stupid tile. You see deck flowers here, I see pots from last year and about five new pots which will all either have to come indoors or find some other safe spot for the winter. New pots are becoming a problem. The terra cotta and glazed ceramic that I hated when younger are now irresistible and I’m always bringing home another one or two. I wish I had access to fancier ones (and could afford them) but for now the Depot and Lowes are nice and convenient. 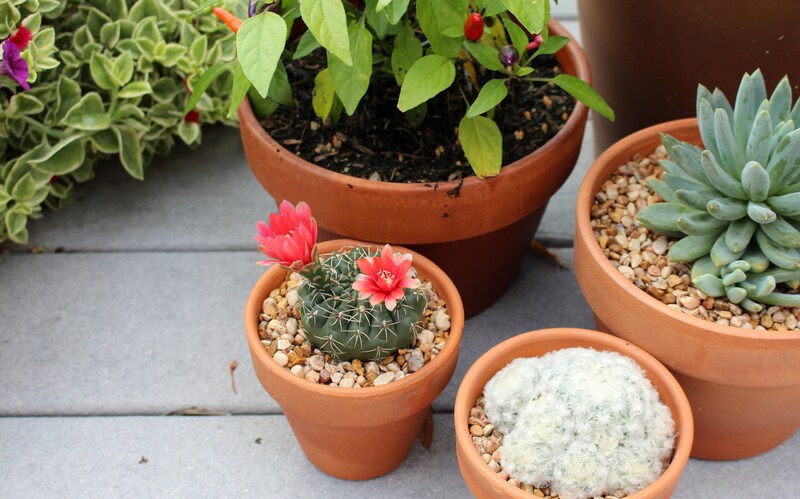 The cactus and succulent need a nice heavy pot to keep from tipping over, plus unlike plastic the terra cotta breathes, and even when overwatered the roots still get enough air to not mind. Just how bad it’s become will only really show up in another few weeks when I need to find wintering spots for them all. Even if I don’t bother and let the plants freeze and die, the clay pots can’t. They’re porous and absorb water and when that water freezes and expands inside the clay it will likely crack the pots. The miscanthus divisions from this spring have grown huge, and although they are planted in red plastic pots which can be left out all winter without being damaged, the plants will die when winter hits. 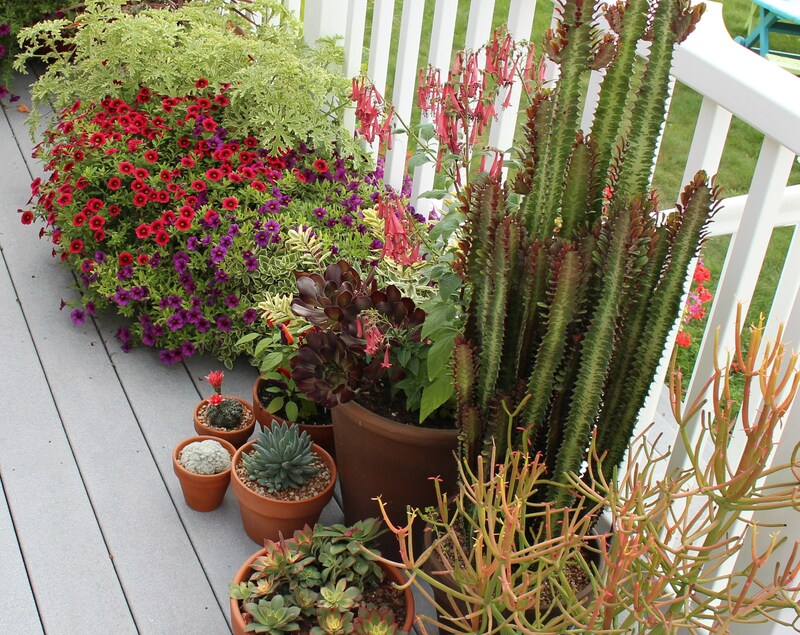 In pots, exposed out on a deck, plants generally lose about two hardiness zones. Not everything is in fancy terra cotta. 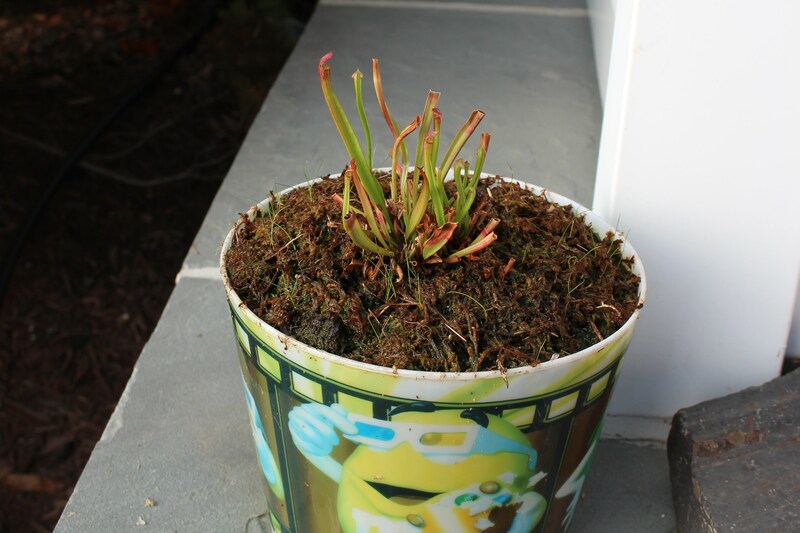 This pot features a struggling pitcher plant which is the focal point of my exciting new bog garden. Although there were a lot of complaints when certain family members discovered their ‘favorite popcorn tub’ was the only container I could find without drain holes, I think it’s working out fine. I just wanted to add that things would be much greener if it didn’t dry out completely when I took the kids on a long weekend visit to my parents. Apparently someone here thought the weak rain we had would be enough to keep it alive…. regardless of the explicit watering instructions I left for this one little pot! Rather than bear the label of “too cheap to buy a real pot” I’d like to think of this as recycling, or upcycling one of the many disposable plastic things children generate. 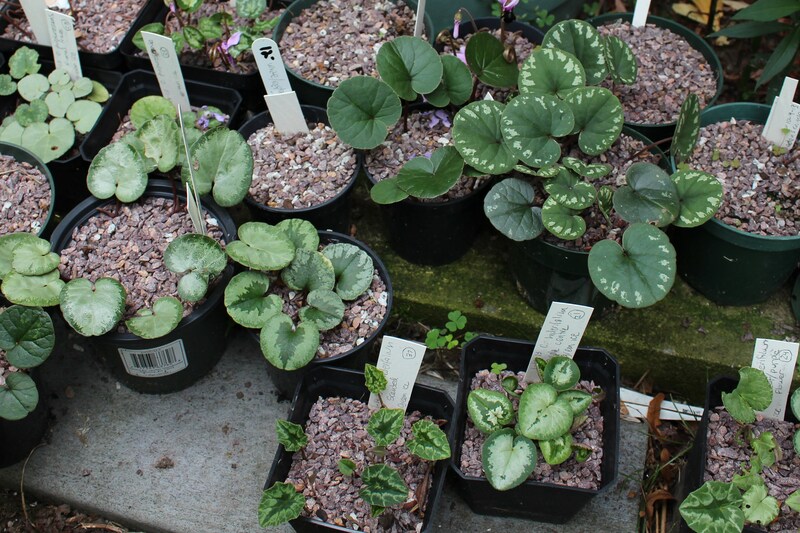 ….and there are still plenty of cyclamen in pots. For as much as I try, new ones keep showing up! Aren’t they the coolest little things? The cyclamen in pots always seem to sprout earlier than the ones in the ground….. and no, I didn’t spend $12 dollars on the empty pot, it’s just a second label to remind me this one comes back in under lights for the winter. Thankfully I don’t grow any colchicums in pots. This is a new favorite from ‘Daffodils and More’ and makes a nice start to the season. 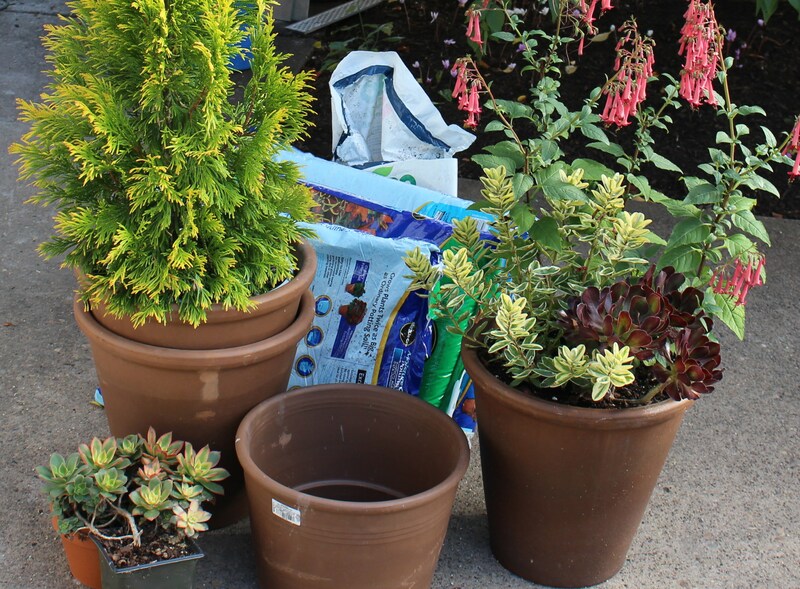 This entry was posted in cyclamen, deck plantings, garden design, late summer, Uncategorized and tagged Container plants, growing plants in pots, plants for the deck, terra cotta pots. ← Same old story, dry again…..
Beaconsfield is a small town in England, west of London. Disraeli was 1st Earl of Beaconsfield, I think you may be mixing things up. Thanks for clearing it up, so much of that is confusing to me, I wouldn’t be able to tell an earl from a duke from a debutante! That would make a lot of sense, I could see how the mixup would be made. I wonder if there are any other plants as mixed up as colchicums, if it wasn’t the names being confused it’s the bulbs being sold as this and that. Christina added a comment that beaconsfield wasn’t the home of Disraeli, it was the name of the village. Disraeli was the earl of Beaconsfield but I guess he never actually lived there. Keep in mind this is all off Wikipedia, my knowledge of English lordships and nobility doesn’t go beyond the queen. A nice bit of honesty here Frank! Some terracotta can stay out if its been fired at a high enough temperature, the problem is of course that you never know for sure that it has. Love the Miscanthus in the pot (great choice), makes me think I might do the same next spring to make sure some get plenty of water. This year the early flowering ones already look great. I’ve done the miscanthus in a pot before and really missed it last year, so I’m glad to have it back. My deck is so white with all the vinyl I’ll take whatever I can get in the way of covering some of it. I have a few pots which claimed they were frost-proof, I’m just not brave enough to test it! Makes sense to me! I like the concept of an “emergency nursery stop,” and your idea of “cook’s treat” when you pass the wine to your wife! Great you could get a deal on the pots–they can be ridiculously expensive! I’ve gotten some nice ones late in the season in the clearance shed of our local Agway. With the weather behaving the way it is, I fear we all may be bringing pots inside sooner than later. That’s funny, I got some great deals at Agway last summer too. I was quite pleased with myself 🙂 Also I was surprised to find some harder to find perennials there. The smart thing to do now would be to begin working out who comes in and who doesn’t…. also now is the time for cuttings, not in the dark the night before the first frost! I don’t know whether you saw that I responded to your comment on one of my recent posts, so I’ll repeat myself here to tell you I live about an hour north of The Crossings, up in Honesdale. We should make a plan to see each others’ gardens sometime in the future! Are you perchance a teacher? I noticed that once school started, your posts became less frequent! I’m a stay home mother, but I teach violin lessons from home. I did miss the other post, sorry. I had you down in the other end of the Poconos, and yes I’m a school teacher (High School). You could easily figure out which school based on the fact they’ve thankfully closed our school today. Last night’s meet the teacher night was nerve wracking with all the police, roadblocks, and house and yard searches. A bus full of kids on these roads would scare me. I like your logic that after buying 4 pots and a bag of compost you have saved money. I love pots too but what are we to do with everything when the cold weather comes? 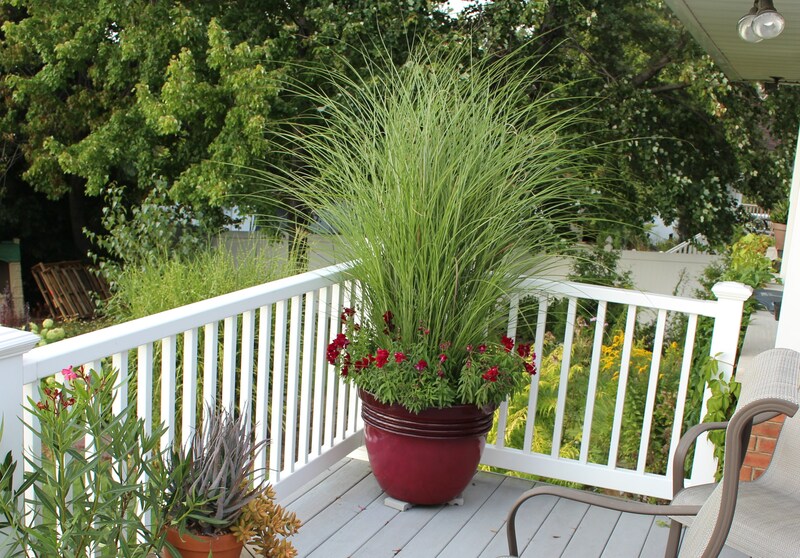 That Miscanthus looks great in a pot, I might just copy the idea next year. Hi Chloris, I also didn’t quite understand the economics of saving money by spending it, but let me try and explain it to you the way it was explained to me. Something (say a $100 purse) is listed for $60. Right off the top you saved $40. If the item is then on sale for 50% off you save another $30. If you pay with a giftcard it’s actually free. Now this is different than the money saved by doing a home improvement project as DIY. My basement tiling has somehow actually created money, and this money has promptly been used to purchase new rugs and bath towels. Don’t ask me about specifics, that’s as far as my understanding goes. Economics is a confusing area. I think I have 85 pots, almost all glazed clay. Check out Home Goods to feed your addiction. How are you going to over winter your miscanthus? I really love it in that red pot. I did make a stop at HomeGoods this spring 🙂 Good thing it’s far enough away that a once a year visit is all I can manage! I may or may not protect the miscanthus. It’s much easier to cut out the dead and replace it with a new division come springtime, so there’s not much motivation to lug the planters to a protected area. I make frequent ’emergency stops” this time of year. Not all of them end up in purchases, but they seem fine with that at the nursery! Most of my wintering over areas are only slightly better than death, the light is low, the watering infrequent, and bug infestations are common. Luckily I can just ignore them and hope for the best. I wish I could find some pot bargains here – I am always so shocked at the cost of them. 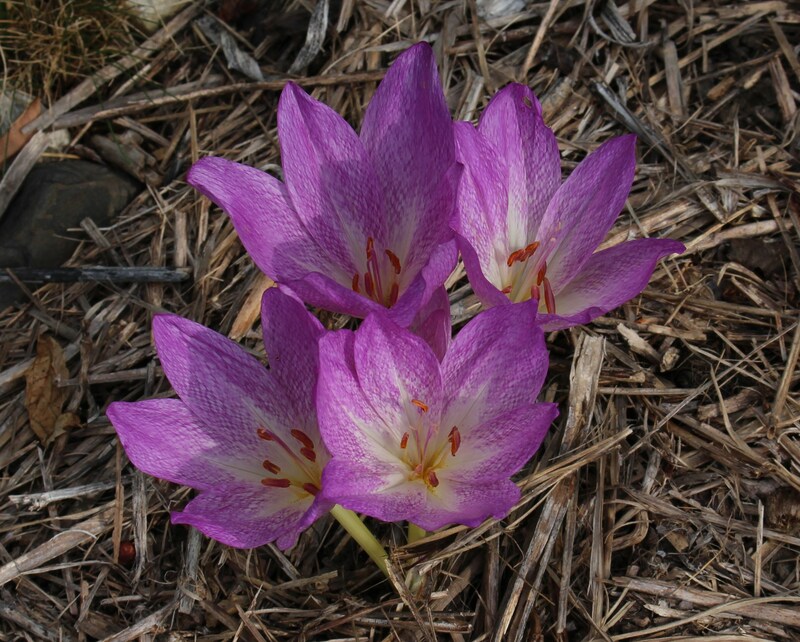 I love your colchicum. Thanks for the comment Annette, I’ve been lucky here and there with the pots but you’re right that the really nice ones are shockingly expensive…. and I don’t even shop at the fancy places! The good thing is they will last forever if cared for. I just hope my laziness doesn’t get the best of me one winter and I lose them all. Oh I do love an Emergency Nursery Stop. Your potted plants look glorious. As always, this was an entertaining post Frank. Emergency nursery stops can be good for your health. I need to make one soon myself.